This compact Rudbeckia was bred by Andre Viette, a nurseryman from Virginia USA. 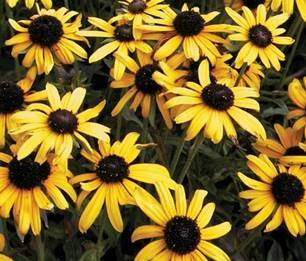 It’s a smaller version of the standard Black-eyed Susan mature height is around 40cm with a 40cm spread. It’s compact habit makes it ideal for todays smaller garden, its also good for containers and patio planters, makes a good late flowering display. So when selecting subjects for plant breeding you can see it’s important to select for colour and height and also take into account today’s market trends in plants. Having a series that has variations in colour, flowering either singles and doubles is good and makes it easier to get a take up commercially if there are more to follow. So if you have different selections of Rudbeckia growing in your garden its worth taking some seed from each, germinating these and growing on to see if you get anything different, imagine a shorter Rudbeckia with different colours, flower size etc. As you can see from the picture above new cultivars can be created be from plant breeding and crossing. It’s a long process, its good to look at plants in your own garden, looking for improvements that may be possible. You see with the Rudbeckia by getting a shorter flowering plant it makes the plant more fitting for todays market and also for growers more plants can be transported on a lorry in flower as its shorter so it’s a good growers plant. You must keep records of any crossings you make. Be critical when making a selection, be prepared to be strict when discarding plants. Pictures are important so get the camera ready to take photos to record your work. For developing your new plant breeding selection or new plant discovery I can offer full trialling and new plant development service more details available on my website. Also pictures can be taken, recorded and stored if needed. Well although the weather has now changed to cooler conditions at night and we have had some welcome rain, lawns are beginning to recover, the Daytime is still warm and now at the 2nd week in October it has turned very dry again, welcome rain is forecast at the end of the week, if the skies are clear at night then frost is possible so watch out for tender plants, temperatures are forecast to be around 22°c ! mid-week this week. We are only 2 weeks off the change from British Summer Time to GMT, incredible weather. You will still need to keep all baskets and tubs watered and checked each day but reduce amount of watering keeping them moist and not wet. Time to plant autumn bedding, will last now until the spring, try mixing different plants, evergreen and flowering for interest. Planting tulip bulbs, Daffodils, try some in tubs and patio plants mixed in with bedding to give early colour. Apply liquid feed regularly once a week is ideal, but good to finish at the end of the month, I reduce rates as you do not want a lot of soft growth on hardy plants now. Look out daily for slugs and snails check your local garden centre for best controls, an idea I have seen is to place an old roof tile on ground, snails go under here during daytime just turn over and pick them off each day. Deadheading plants like Dahlia will prolong flowering. At the end of the month as the Dahlia finish it will be time to lift and store, more next month. Good time to plant new perennials they will establish before the winter and get a good start in the spring and be ready to have some resistance to drier conditions as they will be more established. Perennials dying down or fading can be trimmed back to encourage growth before the winter, good idea to give all borders an autumn tidy. Divide perennials and alpines looking tired and not flowering as well, like Crocosmia. Regular weeding and hoeing whenever you can will keep weeds under control. If time is short pull off seed heads this will help to reduce seeded weeds. Start winterising the garden insulating plants like Tree Ferns and Banana’s. Good time now for seed collection now, storage is important, remember cultivars will not come true to type. You can sow sweet pea seeds now for early flowers next year, sow more in spring for later flowering. You can continue to trim evergreen hedges now. you may also see white c shaped larvae, apply a biological control, plants in containers are unlikely to recover. Sedums and Geraniums can be badly affected. Prune climbing roses once flowering is finished, remove all leaves underneath plants this will reduce fungal problems like blackspot and rust. Leaf clearing will start now as trees and shrubs start to turn and lose leaves. Time of course to picking your apples and pears. Continue to mow lawn regularly, keep edges neat, still time to apply weed killer for perennial weeds, use a selective weed killer here. Seeding and repairing of dead patches can continue now through the month, but you will need to water as weather can still be quite dry. Ideal time to lay new turf or turf to repair lawns, but you will need to keep it watered, especially given the temperatures at the moment and dry conditions. Apply a fertilizer but do not use summer feeds as these are too high in nitrogen fertilizer, slow release is best. Do not apply in drought conditions, if using feed and weed avoid getting onto ornamental plantings as it will cause damage. If you have wild flowers in lawn and want to keep them then do not use feed and weed. During the dry period if you are watering the lawn do this at night when evaporation is low. If you have a pond then still keep water circulating, using waterfalls and pumps, fountains etc. – day time temperatures are still quite high. Clean filters as needed, remove blanket weed and skim off floating weeds such as duckweed, feed fish as needed. Remove any debris leaves etc reduces toxin build up, if you can put a net across to catch leaves. In the Greenhouse, open greenhouse on warm days. You may still have tomatoes etc, but now is the time to start clearing out old plants growbags etc. Keep greenhouse clean, time for a good clean up now. Citrox is a good cleaning product. For vegetables there is still time to plant leeks from leek plants and onions from sets. Time to plant broad beans, Garlic, and spring cabbage plants if you can find them, look in local garden centre. You can also set up new Asparagus beds. You can grow herbs over winter if you dig some up and move indoors, they will need good light, don’t overwater. Time to paint fences and sheds carry out any repairs, in the greenhouse replace any broken glass needed before winter, take advantage of the evenings while they are still light. Take time to relax in garden at some time each day while it’s still light in evenings and warm enough for barbecues and generally enjoying the fruits of you hard work. The garden should be an extension of your house an extra room if you like and it will be looking good.